The Collinsville City Commission met Friday, June 15th (at the City Hall Community Room, 106 N 12th Street) for a 1pm Special session of the Municipal Authority & City Commission. The only agenda item was a public hearing on the proposed FY2007-2008 City Budget. CMA Chairman & Mayor Stan Sallee was present. CMA Trustee & Commissioner Trent Rogers was present. CMA Trustee & Commissioner Melodie Bateman was absent. CMA Trustee & Commissioner Pam Porter was present. CMA Trustee & Commissioner James Rigdon was present. The attendance at the Friday 1pm special session was "large" in comparison to most Collinsville City meetings ... especially "Public Hearings". The majority were Collinsville Downtown, Inc. (Main Street) supporters. 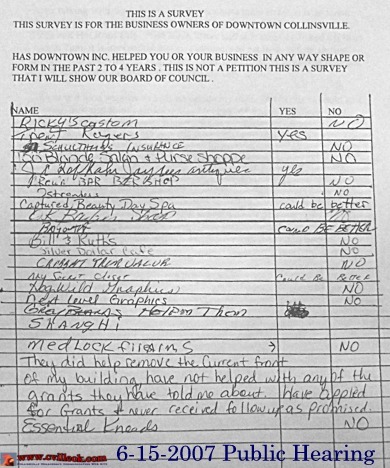 Collinsville merchant Rick Hall spoke against the city budget item to fund $12,000 to the Main Street organization and supplied copies of a "survey" he had taken (shown below) to the commissioners for their consideration on the subject. Included below are the survey and letter supplied by Rick Hall. I also will try to summarize a packet supplied to the commission by Collinsville Downtown Inc. I will also list a few of the significant line items highlighted by City Manager Pam Polk in her summary for the commissioners & public present. I'll also have a few "editorial comments" of my own at the bottom of the page. I welcome addition comments in the form of "Letters To The Editor" but they must be in digital form (email wrightted@aol.com) and the contributor identified. The comments above and below were collected by Rick Hall in a 1-day effort and do not reflect a complete survey of all Collinsville merchants. Although a Main Street supporter, she questioned what appeared a $2,000 increase (from $10K to $12K) to the Main Street organization this year (Mayor Sallee indicated he believed it was the same $12,000 amount as last year?) ... especially with the potential future use of the City Annex building by Main Street (CDI). 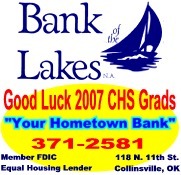 Collinsville Downtown, Inc. is a member organization of the Oklahoma Department of Commerce Main Street Program. The Oklahoma Main Street Center helps Oklahoma Main Streets to once more become thriving centers of commercial and social activity. The Oklahoma Main Street helps communities analyze core issues and set attainable objectives by providing education, training, resources, and advocacy. Our organized yet flexible approach allows communities to identify and develop their assets in an integrated and comprehensive way. Collinsville Downtown Inc. follows a national model called the Main Street Approach to Downtown Revitalization, currently utilized in over 1800 communities. Developed by the National Trust for Historic Preservation, the program advances economic development within the context of historic preservation and advocates public-private partnerships to ensure lasting success. The Main Street Approach promotes a return to community self-reliance, local empowerment, and the revitalization of traditional commercial districts based on our unique assests such as distinctive architecture. pedestrian friendly environment, personal service, local ownership and sense of community. For full disclosure, I am a former (original) CDI board member. I support the overall objectives of the Main Street program. I don't always agree with the local implementation of the national or state objectives. The letter and survey above make it obvious that a better job must be done to communicate and interact with many of the downtown merchants (and I suspect most of the citizens). The Collinsville program has come a long ways and made a significant impact on the overall health of downtown. That has been accomplished by a handful of non-paid volunteers that continue to make huge sacrifices to make long term sustainable improvements in Collinsville. The only paid position is the part-time Program Director. CDI has had 3 program directors and I just learned, is searching for the 4th. Over 200 individual volunteers worked short term to make the Hogs 'N' Hot Rods event possible. I symphasize with local merchants wanting (and needing) immediate results to survive in a difficult retail environment. 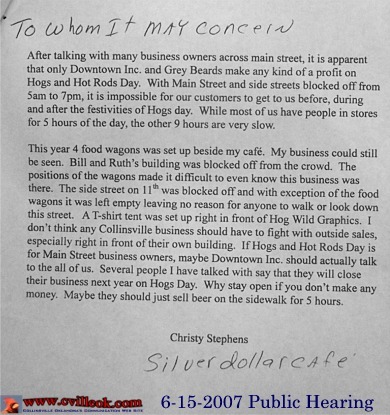 I don't understand how a merchant could see having thousands of people brought within a few feet of their front door in a single day (Hogs'N'Hot Rods) as a problem. It is the job of each merchant to be creative to get those potential customers into their front door (not CDI). Eliminating outside vendors would require additional funding for CDI to survive and/or put on such events. The CDI "Taste of Collinsville" event actually brings potential customers inside participating businesses. It is my opinion that Collinsville Downtown Inc. (the Main Street program) provides a great service to the overall success of Collinsville (especially the historical downtown district which is their primary objective). I am amazed any merchant would be asking for fewer events instead of more events downtown. I don't know the details but have a partial understanding that a similar merchant response "killed" Founders Day formerly put on by the Chamber of Commerce.. I commend Rick Hall (& any citizen) taking the effort to attend a public hearing (or commission meeting) at City Hall where tax payer dollars are being spent daily with limited public visibility. I am amazed so few people attend city (and school board) meetings and request more insight into how their money is spent. I am amazed so few people attend CDI meetings to make suggestions or ask for more information on events, grants, and how thay can help or participate. I suggest CDI provide a more effective means to communicate with Collinsville merchants and citizens. I suggest CDI provide training and services more directly in-tune with Collinsville. By the way, city and school meetings are agenda limited and public interaction is limited to those agenda items. Written requests for public information may be a better first step. It is the primary role of the elected city commissioners (& school board members) to provide a level of oversight (for us) for public funds being spent, but that doesn't exclude further public participation.